The basic Apalis 3D model contains the PCB and the maximum component height on top and bottom of the module. The Apalis T30 3D model is simplified and contains only the PCB and the CPU. It is intended to be used for heat spreader or heat sink designs. The CPU height is a typical value. Due to production tolerances, the actual height of the assembled component can be different. Please use the generic Apalis mechanical model with the maximum component height for testing the mechanical fit. This ensures the mechanical design fits all current Apalis modules as well as future releases. 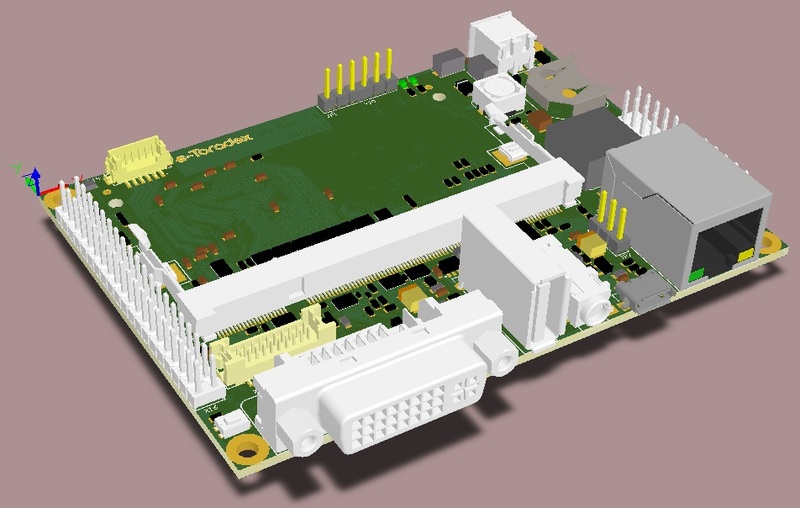 The Apalis iMX6 3D model is simplified and contains only the PCB and the CPU. It is intended to be used for heat spreader or heat sink designs. The CPU height is a typical value. Due to production tolerances, the actual height of the assembled component can be different. Please use the generic Apalis mechanical model with the maximum component height for testing the mechanical fit. This ensures the mechanical design fits all current Apalis modules as well as future releases. The Apalis TK1 3D model is simplified and contains only the PCB and the CPU. It is intended to be used for heat spreader or heat sink designs. The CPU height is a typical value. Due to production tolerances, the actual height of the assembled component can be different. Please use the generic Apalis mechanical model with the maximum component height for testing the mechanical fit. This ensures the mechanical design fits all current Apalis modules as well as future releases. It is a generic STEP model that can be opened and modified in any 3D CAD. It includes Type 1, 2 and 3.